The month wouldn’t be complete without tournament brackets. And not to be outdone by the NCAA’s basketball showdown, Naval Air Forces has created a competition of its own. But instead of matching up the best basketball teams in the country, this bracket pits aircraft carriers against each other in a Facebook-based competition designed to determine the best aircraft carrier in U.S. Navy history. Every week is a new round, until the April 5 championship game (or contest or match-up or whatever this type of competition should be called). 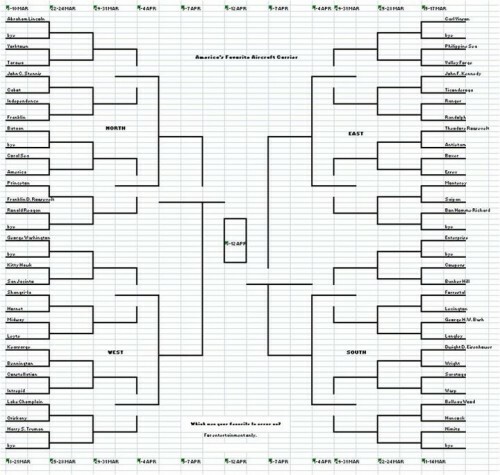 While it takes the form of a tournament bracket, the actual competition appears to be more like American Idol. Instead of the most physically capable contender advancing to the next round, the most popular ship, as determined by “likes” collected on an accompanying picture of that carrier, moves forward. It’s a democratic system that gives older, antiquated carriers a fighting chance, but gives the Enterprise, a carrier whose name has appeared on several other vessels, including a fictitious spacecraft, a large amount of alumni support… consider it a home court advantage. if i had a vote it would be CV-6 the first Enterprise. well not the first Enterprise, but the first carrier named Enterprise. Simple: just count the Battle Stars.